At home during these weeks I worked on some more pieces for my art folder – matching colours with moods. It isn’t something I was keen to do, because I think it ends up being a cliché to say that red means angry/blue means calm/yellow means happy… I just felt like it was a waste of time. However, I thought of a way in which I could diversify it slightly. First of all, I wanted to use paint, rather than pastel, crayon, felt tips or collage because it provides the opportunity to blend colours so much more easily. 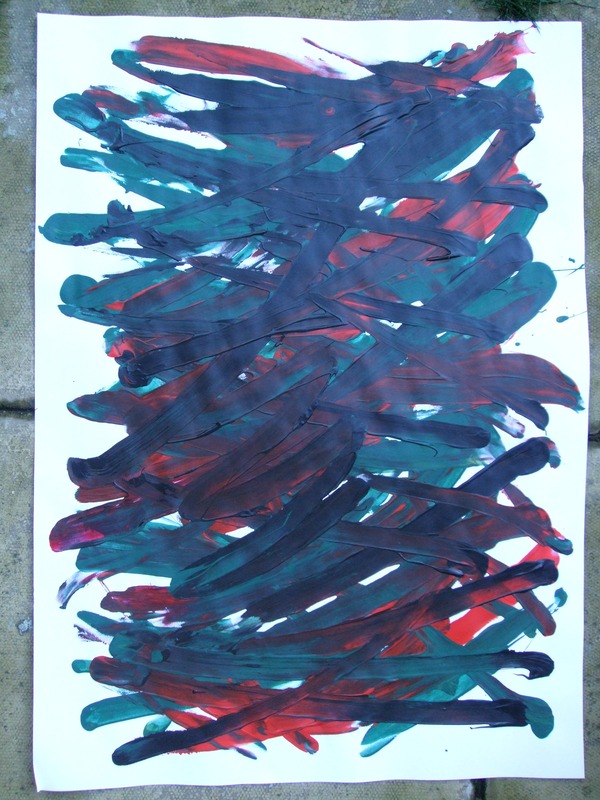 I also felt it was important to use my fingers to paint rather than a brush. This painting was focusing on emotion, so I wanted to be able to feel the paint, and apply it directly to the paper. I thought I would keep it simple and focus on three main things: calm, love/sensuality, and anger. I started with my calm piece. I took a selection of different blues and greens for this, and yes, this does fit in with the cliché mentioned above, but here’s why these colours do evoke a feeling of calmness for me: I love the sea! Watching the sea is one of my favourite things to do. I can let the movement and the sound of the sea fill my head and empty it of most other thoughts. But the sea is not always blue, it can be all sorts of wonderful shades of blue and green. (It can also be grey and brown, of course, but let’s pretend it’s always blue or green!). 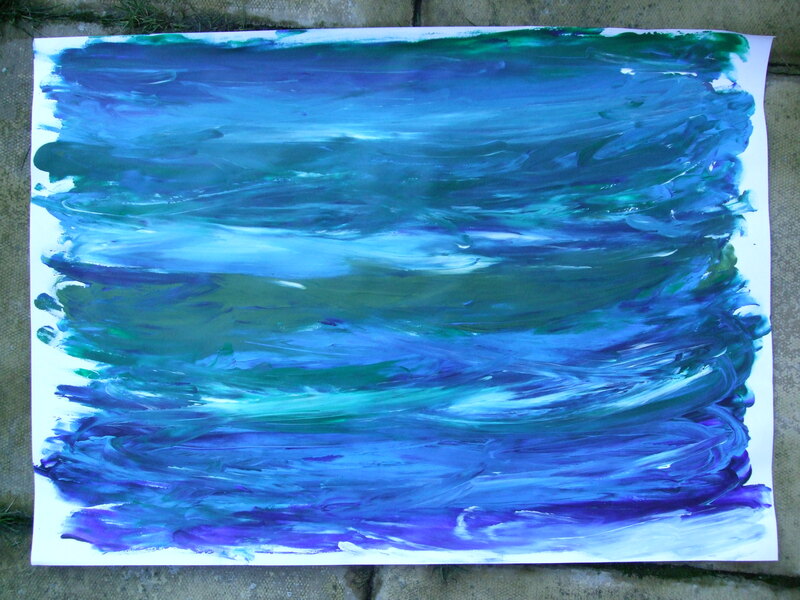 So here’s my calm painting – nothing special – just a blend of different blues and greens and white, using wavy strokes. 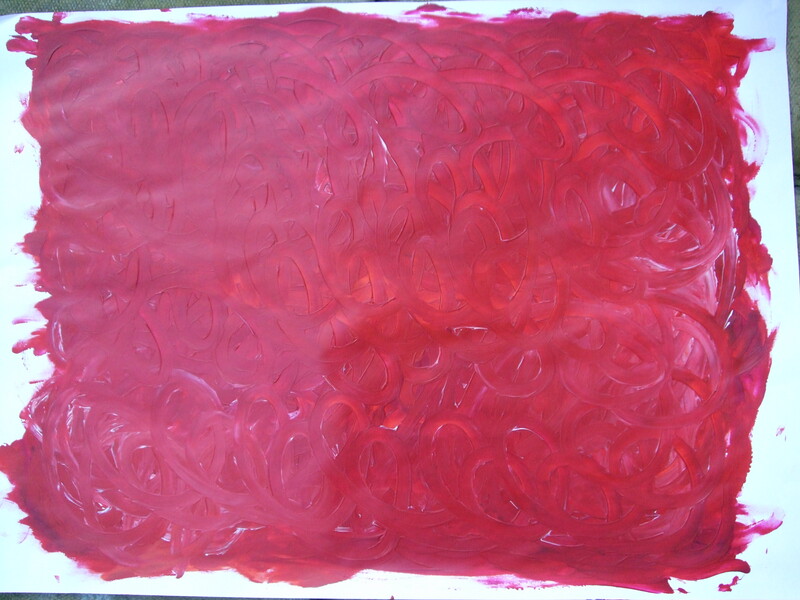 Next I did my love/sensual painting! For me this involves red and pink. I decided to use swirly, curly, loopy strokes for this, but I’m not keen on the finished result. I don’t think it achieves my aim: when I look at the finished piece it makes me think of internal organs or something (which is not at all sensual! ), but maybe I’m just sick in the head…?!?! I’m reluctant to include the piece in my folder, but I suppose it’s all part of the process, and this blog (which I am submitting with my work) will explain how I feel about it! Finally I did my angry piece. I knew for this I needed three colours: dark blood red, dark racing green and black. I used harsh, angry, slashing strokes (almost like war paint), and ensured that the colours blended in an ugly, dirty way by overlapping the strokes. I’m quite pleased with the result: I don’t like it, but I think it truly captures a feeling of anger. 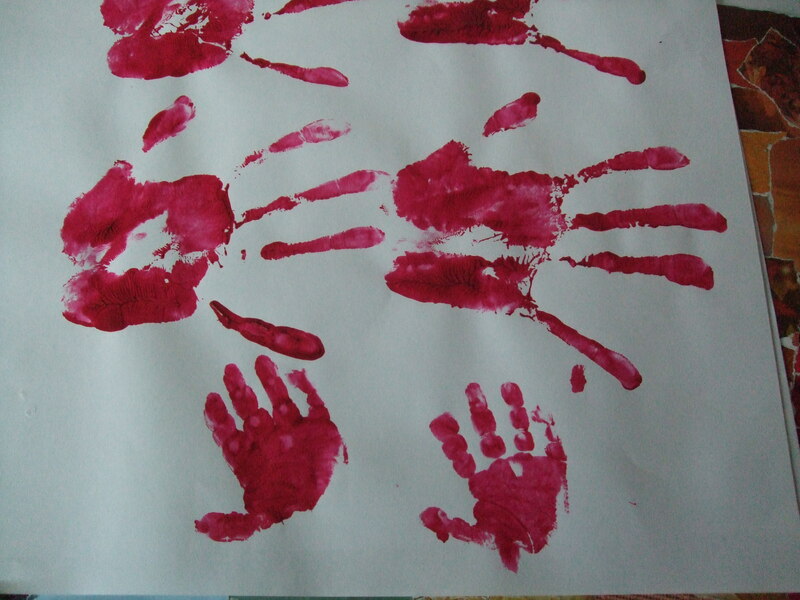 To finish off my painting session, I did some hand prints with my daughter, which I think she quite enjoyed! Pre-wash your fabric on the cycle which you will use to wash your garment once it is made (you don’t want it to shrink after you’ve made it!). Before doing so, pink or zig-zag stitch the raw edges of your fabric to prevent fraying in the washing machine. Once your fabric is dry, fold it so that the right sides are together and the selvedges match up exactly. Almost all commercial patterns are cut with the right sides of the fabric together, unless specified differently in the pattern. Your raw edges will be at the top and bottom of the piece of fabric. Now iron the fabric (being careful to select an appropriate temperature/steam setting). Your pattern will come with a cutting layout, showing you where to place the pattern pieces on your fabric. If there is no cutting layout, arrange the pieces as best as you can, fitting them to use as little fabric as possible. Having made my own pattern, I had to decide my own layout! Pieces which are to be cut on the fold must be lined up next to the fold of the fabric. This will be on the straight grain because the grain line runs parallel to the selvedges. Pieces which are not cut on the fold should have a grain line marking. You must make sure that the grain line marking matches the grain line of the fabric. The easiest way to do this is to measure from the top of the grain line marking to the selvedge of the fabric, and then again from the bottom of the grain line marking. These measurements should be the same. If the grain line is not lined up properly before you cut out the fabric, you could end up with a very wonky garment, as fabrics tend to stretch more if they are cut on the bias (i.e. diagonally). Sometimes this is what is required, but the grain line marking will tell you! Lay your fabric out on a large, long, flat surface – a table is ideal, or the floor! The smoother the surface, the easier it is to pin and cut, so don’t use a bed, or the floor if you have a deep pile carpet! Pin your pattern pieces onto the fabric, starting with a pin at both ends of each grain line to keep the pattern piece in the correct position. I usually pin the grain line, then the corners, then the sides. I use pins every couple of inches. Finally, you can cut your fabric! Try not to lift the fabric too much as you cut by keeping the bottom of the scissors close to the table/floor – this will help you to cut accurately around the edges. Lay your cut pieces out somewhere flat. Voilà – fabric cut! So…back to my progress on the skirt. In week thirteen I had to re-draft my lining pattern for my skirt, because of the alterations I had made to the toile. I took Debbie’s advice and made my lining yoke 8” deep, to match up with the zip. Previously it was smaller, and that’s ok, but I like the idea of it finishing where the zip finishes. On my cutting instructions, I specified to cut a layer of interfacing the same size as each yoke piece as well, to give sturdiness to the skirt, because it has no waist band. Regarding the embellishments on the skirt, I practised a blanket stitch for appliqué work using my new machine, on a dress I made for my daughter. I like the way the stitch looks, and I’m going to see how it would look with my nautical stars instead of using a zig zag stitch. 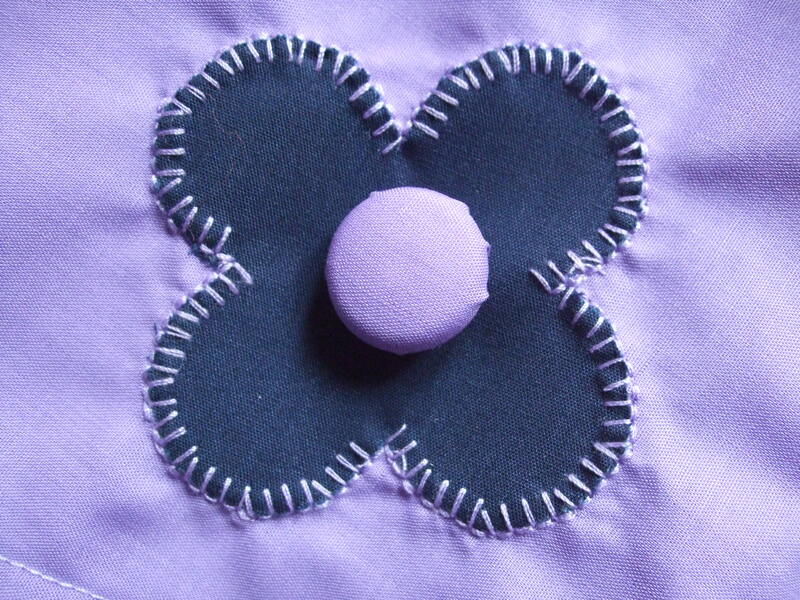 First use of my new machine's blanket stitch to do some applique, and first use of self-covering buttons too! Next week: more on embellishments!